All images are copyright of GMS Photography LLC - © 2007-2013 GMS Photography LLC All rights reserved. Any redistribution or reproduction of part or all of the contents in any form is prohibited. You may not, except with express written permission from Gary M. Slawsky, or via purchase through this website, copy, distribute or exploit the content.You many not transmit images from this site or store them in any other website or other form of electronic retrieval system. Any questions regarding these images or requests for special usage not available through this site should be sent via the "contact" button at the top of this page. 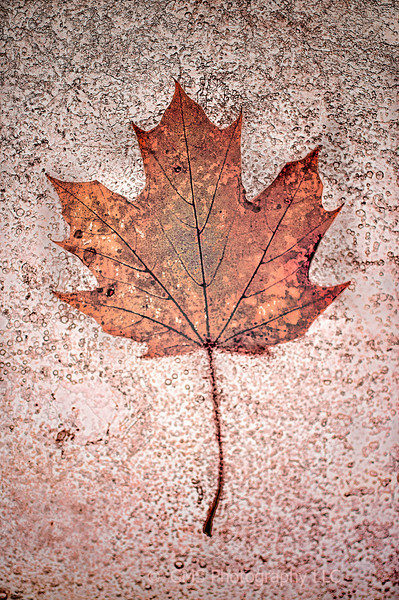 An autumn leaf takes on a mystical appearance wile trapped in layer if ice.